This exhibition spotlights the importance of drawing as both device and artifact for research. For very distinctive reasons, each artist included uses drawing as intake valve at the heart of their interest as citizens, artists, seers and readers of the world around them. They comment, metabolize and rebroadcast their learning through drawings, further framing their narratives in video and image text configurations such as comics, zines, monographs or graphic novels. They all have sustained, incessant interests in their subjects, which are tied to narrative currents both personal and historical, high and low, and they use drawing to foster, distribute and broaden their perspective subjects. 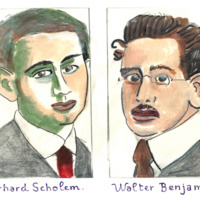 The seed for the show was sown by encountering the singular, autonomous work of Glicenstein, Uncovering Walter Benjamin, which sparked an immediate desire to put the work in front of the student body alongside similarly research-based if aesthetically distinctive projects by younger artists, using it as a model for building artistic and historical consciousness through practice. For more information, please read this piece from the Third Rail Quarterly.